The marching cubes algorithm can be separated in two steps which are the active voxels allocation and the vertices/normals generation. The first step uses a iso level value that defines a surface from the potential, where the active voxels are the ones that are intersected by the corresponding generated surface. To check the intersections all the edges from each voxel are evaluated. An intersection is obtained if the potential value from one of the corners of the edge is below than the iso level and the other corner’s potential value is above. The different intersections represent one of the 256 possible combinations defined in the marching cubes implementation. These combinations, expressed in tables, help to know the total amount of vertices to generate, and the edges where these vertices would be allocated. The second step is responsible to generate the vertices positions and normals in the active voxels, this is done taking into account the quantity of vertices/triangles required for the case obtained in the previous step. This pass allocates the edge where the the vertex will be placed, and sets the vertex position with a linear interpolation between the two corners from the edge using the iso level as an interpolator. To apply the previous two steps explained it’s important to translate the different tables in the implementation from Paul Bourke into two textures. The first texture saves the 15 possible vertices to generate for each of the 256 combinations presented in the marching cubes, the data can be obtained from the “triTable” found here. This two dimensional data table is expanded in a one dimensional array containing 3840 values (notice that 16th value from each dimension is always -1, so this last one is always discarded), and then allocated inside a 64×64 2D floating point texture. Each fragment saves the corresponding edge where the vertex would be generated in the active voxel where values with -1 represent that no vertices need to be created for that edge. The resulting texture is shown below. The previous texture is a color encoded visualization from the original floating point texture, each square represents a position where the color defines the edge where the vertex will be allocated. Notice that every 15 squares a new combination is defined, and for each combination the colored squares represent the vertices to generate, and the black ones the “-1” values meaning that there’s no more data needed for that combination. 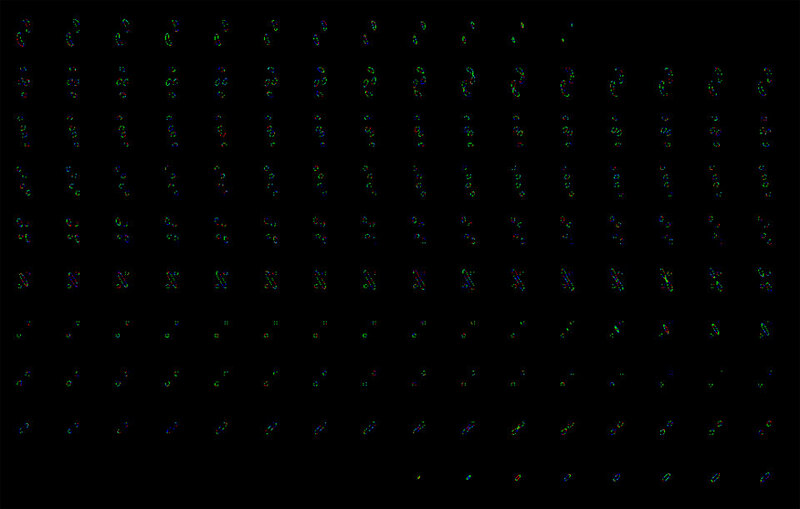 The second texture to create is also based from the “triTable” used before, but with a different interpretation, the idea is to save the amount to triangles to generate on each one of the cases, these 256 values are saved inside a 16×16 2D floating point texture where all the channels contain the same value; the amount of triangles to generate for each case can be obtained counting the values that are different from -1 and dividing the result by three. The following texture is shows the visual representation of the data. With the two previous textures it’s time to evaluate the active voxels, to do so the 3D expanded texture is used to check a condition where each corner of the voxels is tested to evaluate if the corresponding value is below the iso level required. The implementation from Paul Bourke uses bit masking to define which case is used based on a 12 bit number; in the current implementation, a floating point sum is used to represent the case that defines the triangles to generate since GLSL doesn’t allow bit manipulation. The process is done drawing a quad where the fragment shader evaluates all the voxels defined in the 2D texture to evaluate, doing so the whole 3D voxel space is evaluated at once. The following code executes the active voxels search. //Texture container the potential values in the corners of the voxels. //Iso level used to define the surface required from the potential. //Function used to evaluate the 2D index from a 3D position. //Obtain the 3D voxel position of the corresponding fragment to evaluate. //The MC case to use in the voxel evaluated is calculated as the sum of corners that are below the iso level required. //amount triangles from the 16×16 texture provided. //The resulting fragment saves the amount of triangles to generate and the MC case obtained. The previous shader works over all the fragments generated on the quad, where its UV position is used as a key to obtain the 3D position of the voxel simulated in the texture 2D, this is done using the data from the C_3D constants previously explained. The sampler uTrianglesIndex is the second texture commented at the beginning of the post. Notice that the indexing is based on the actual marching cubes case obtained from the corresponding voxel/fragment. 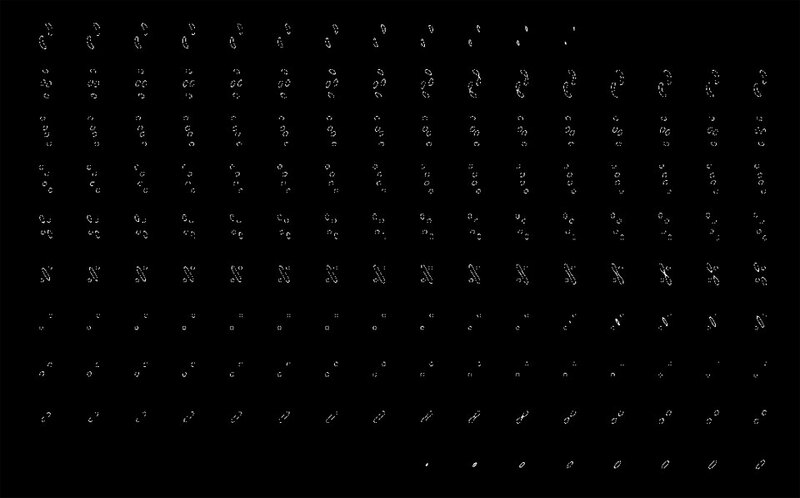 The variable “uCornersTexture” represents the values of each voxel’s corners potential saved in a texture3D, this is generated from the point cloud animation and it’s evaluated against a iso level defined with the uniform named uRange. The shader starts finding the 3D position for each fragment, then it evaluates the corresponding corners and checks if the value is below the required iso level (uRange), if the test passes the case variable is modified to finally define which case from the 256 combinations is the one to implement, this is saved in the “c” variable. Also notice that since the case 0 and 255 represent the case where all the vertices are below or over the iso level no triangles will be generated, hence the C value is defined as zero. Once the marching cubes case is defined the uTrianglesIndex sampler is used to obtain the total amount of vertices to generate for the corresponding voxel. Finally the output of the shader is generated encoding the amount of triangles in the RGB channel and the marching cubes case in the alpha channel. The output of this program is a texture3D which has the active voxels scattered on a 2D texture, this means that a stream compaction pass should be applied to the output of this shader to calculate the corresponding vertices only in the active cells. The result of this step can be seen in the following image. – blue + green (aquamarine): four triangles. – blue + red (purple): five triangles. The image below shows the visual representation obtained from the active cells step, notice that most of the cells require two triangles per voxel (green color), meaning that the algorithm would be calculating a median of six vertices per active voxel. Once the active voxels are allocated and each case is defined for them, a stream compaction method should be applied to the resulting texture avoiding the generation of triangles over non active voxels. To do so the current implementation uses the expansion ability of the histopyramids allowing to allocate offsets of one particular value in the output stream during the compaction process. The compaction process is partially based on this post. In the implementation explained in the previous article one initial base texture is generated from the data texture to compress. This base texture is based on a binary image where each position represent where the data is allocated. Inserting the binary texture in the reduction process the algorithm returns the amount of data (values) in the texture. Instead of using a binary texture, the base texture would be the result from the active voxels step, where each “active “ fragment represents the amount of vertices required for each active voxel. Using this texture in the reduction process allows to know the total vertices required to generate. Once the reduction process obtains the total amount of vertices, the compaction reorganize the texture from the active voxels step, generating contiguous offsets of the same voxel information as many times as vertices are defined for each voxel. The following image shows the difference between a compaction of a binary texture and the texture obtained from the active voxels step. Since the compaction process also returns a unique key for each offset, the result represents the memory required to allocate the amount of vertices to generate, arranged by voxels and indexed by local voxels offsets. This means that the same shader can be used the generate the vertices and normals using the marching cubes algorithm. The new compaction/expansion and vertices/normals shader is shown below. //Pyramid texture containing all the reduction steps. //level 0 of the pyramid. //Corners for any given voxel. //Evaluate the 1D index of the fragment evaluated. //If the fragment’s key is higher than the total of vertices needed to create the execution is halted. //12 steps are required to parse the different levels of the pyramid. //and the MC case used for that voxel. 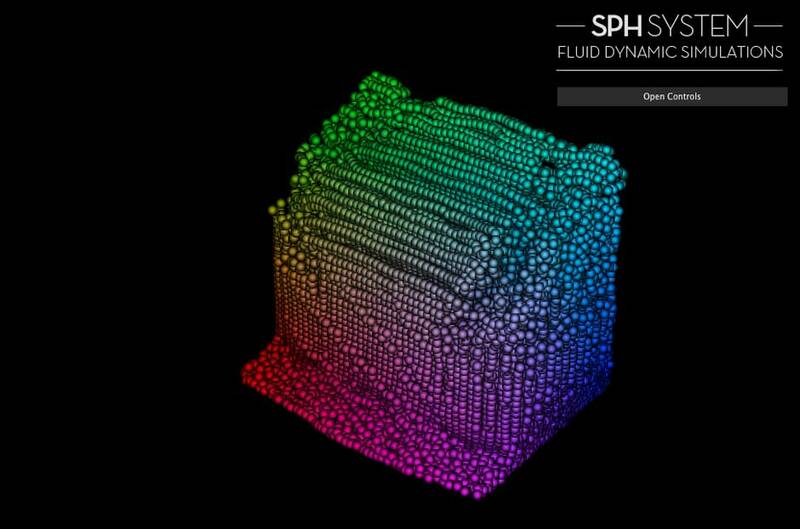 //Calculate the 3D position of the voxel based on the 2D position in the scattered data. //Obtain the one dimensional index to read the corresponding edge to use. //Obtain the edge to use from the voxel using the previous index and reading the data from the triTable texture. //To obtain the two points that define the edge the original implementation uses a set of if conditionals. //The shader makes a sum of all the corners using masks to discard the values that are not needed. //The two points are the voxel position plus the point active using the mask calculated before. //Value used to evaluate the linear interpolation between the two corners points to define the position of the vertex to generate. *or applying a 3D Sobel kernel. //If more smooth gradients are required, a higher order Sobel operator is used to calculate them. //this gives a more smoothed surface at the expense of less performance. //Save the vertex position, uses a linear interpolation between the two corners points of the edge and the iso value required. //Save the vertex normal, calculate as the ponderated median of the two normals from the corners. This shader is divided into two steps, the vertices compaction/expansion process (highlighted in blue) and the vertex position and normal generation for each one of the vertices reallocated (highlighted in green). This fragment shader is also run over a quad that represents the 2D representation of the 3D voxel space. The uniforms for the programs are explained below. – uPyramid: input texture that contains all the different levels of the pyramid generation, is created while doing the reduction process of the histopyramids. – uBase: input texture containing the active cells result from the previous step. – uPot: input texture containing the potential values of the corners from the voxels of the 3D world, calculated in the corners step. – uTrianglesIndexes: input texture containing the edges where the vertices will be allocated, it’s based on the triTable from the Marching Cubes implementation of Paul Bourke. – uTotal: input texture of 1×1 containing the total amount of vertices to generate, calculated during the reduction process, this data could also be read using the uPyramid texture. – uFastNormals: input boolean value used to define if the normals are calculated using forward differences or a Sobel kernel. – uRange: iso level used to define the surface required from the potential. The shader starts evaluating if the one dimensional index key of the fragment to evaluate is lower than the total amount of vertices required, if it’s higher the vertex is discarded. This is done to avoid useless calculations over the quad. If the fragment’s key is below the shader keeps the execution. The compaction process reallocate the vertices needed for each active voxels in the fragments that pass the first condition, it uses the masks explained in here using the optimizations for the reduction process and the compaction step. The result for this first step is the corresponding 2D position of the voxel allocated in the active voxels texture, this 2D position will be repeated as many times as vertices are needed for the corresponding voxel in the subsequent fragments. Once this position is obtained the shader continues to the second part, the positions and normals generation. The second part of the shader starts calculating the 3D position of the voxel based on the 2D position from the input texture, and it reads the marching cubes combination obtained in the active voxels step, finally it calculates the key offset (vertex number) of the fragment relative to the corresponding voxel. With those values calculated the next step is to obtain the corresponding edge where the vertex will be allocated, this is done calculating an index used to read the data from the triTable texture containing the edges. The index is saved in the mcIndex variable, and the corresponding edge saved inside the variable called mcData. Paul Bourke’s original implementation uses a set of if conditionals to check which edge to use depending on the vertex to calculate inside the voxel. In the current implementation the shader uses masks to discard the edges that are not required inside sums of all the possible corners and the position of the voxel. These sums returns the positions of the edge’s corners saved in the variables b0 and b1. The corresponding potential values for these corners are read in the corners texture using b0 and b1 as input indexes, the results are saved in the n1 and n1 variables, then two more variables “diff1” and “mult” are saved to perform the linear interpolation that handles the position of the vertex over the edge. With the gradients calculated and the potentials of the corners obtained, the vertex normal and position is evaluated as a linear interpolation of the corner’s positions using the corresponding potentials datas and the iso surface value to make the interpolation. 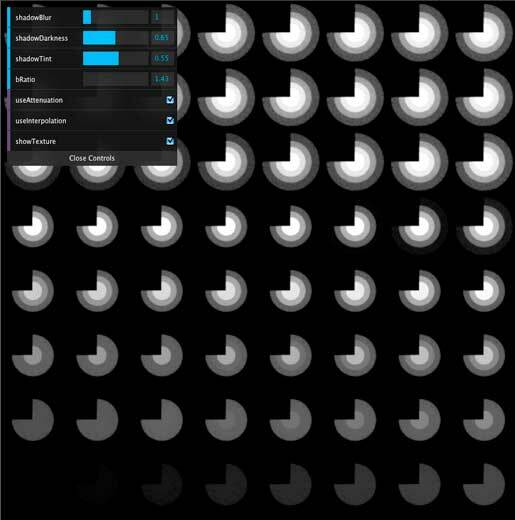 The shader outputs two textures with the compacted data for positions and normals shown below. 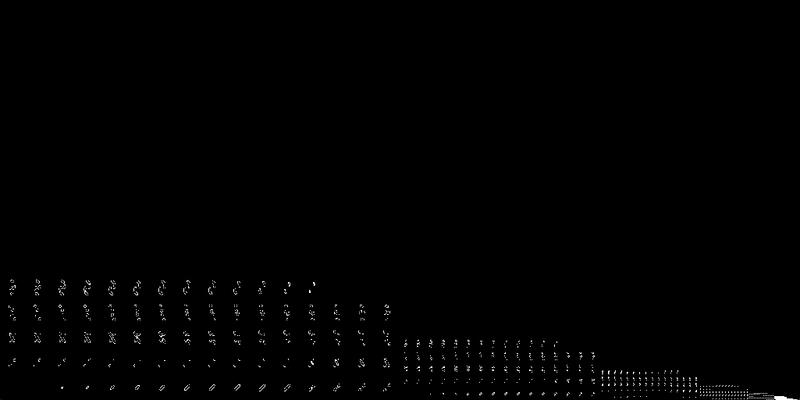 Vertex positions generated from the last step. 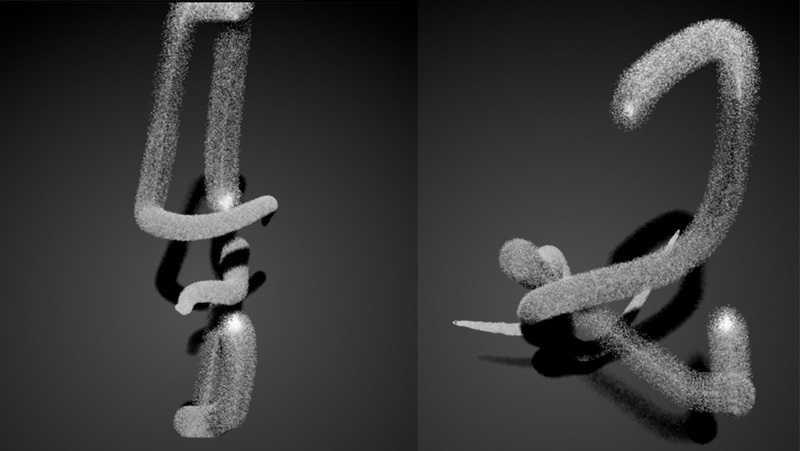 Vertex normals generated from the last step, encoded in the [0-1] space for visualization. Notice that the current implementation recalculates vertices for adjacent triangles, meaning that much of the information from the last two textures is repeated. In order to implement the third method commented in http://http.developer.nvidia.com/GPUGems3/gpugems3_ch01.html a second histopyramid would be required. The idea is to compact the information containing only the edges 0, 3 and 8 from the active cells step (with the second histopyramid) and calculate the corresponding data (vertex positions and normals for 0, 3 and 8 edges) with the last shader explained. The indexes can be calculated associating the original texture obtained in the active cells step, and the one with the 0, 3 and 8 edges. The output of this implementation would be the positions, normals and indexes textures. Tests done with this approach show that the current hystopyramid implementation becomes the bottleneck of the application in terms of time execution, hence requiring a second one for the indexes brings more penalties than benefits for performance. With a faster stream compaction method the idea of generating indexes would improve the performance of the algorithm in general. The reader will notice that the last shader uses two conditional branches, one to discard the fragments where their 1D positional keys are higher than the total amount of vertices to generate, and a second one for the selection of the gradient type. The gradient branching don’t present any divergence overt the threads since the instructions will be the same ones for each one of them, that’s because all the threads use the same boolean (uniform) passed to the shader. The discard branching will present divergence on few warps/wavefronts since the data is compacted, this means that mostly each warp/wavefront containing 32 threads will execute the same code for all the fragments that generates positions and normals. On the other hand all the warps/wavefronts containing fragments with higher indexes would be grouped and discarded at the same time. This is one of the main reasons why data shouldn’t be calculated in a scattered fashion over a texture, in that case every warp could potential show divergence and performance would drop for each one of them, compaction limits the amount of warps where divergence happen. Divergence can also be presented in the color implementation for the active cells evaluation, this is because the different colors are evaluated using a different set of if conditionals based on the result of each fragment’s different data, but since this is only meant for debugging no further optimizations where done in this section of the shader. If the user would like to have a non divergence implementation for the color definition, it’s recommended to use float converted boolean masks on a weighted sum of the colors expected, it would represent more instructions, but all the threads will execute the same instructions at the same time. This algorithm is an iso surface extraction method from a potential field that uses a divide and conquer process locating the surface inside a user defined 3D grid structure (voxels), generating triangles where the iso surface intersects the voxels of the 3D space. The intersection of the iso surface with each voxel can be defined by the cut of each of the edges from the cube that represents the voxel. The algorithm checks the value of the two vertices that define the edge in order to check if one of the edges from the voxel has been crossed by the surface. If the two vertices are below or above the iso surface value the edge hasn’t been crossed, on the other hand if one of the vertices is below and the other vertex is above, the edge has been crossed by the iso surface. Each crossed edge from the voxel generates a vertex position that will be part of one of the triangles to create in the corresponding cube, and since there are a limited amount of edges a finite amount of triangles positions can be defined, being a total of 256 possible combinations present in the algorithm with up to five triangles per voxel. The final vertex position between the two borders is evaluated based on a linear interpolation of the potential value from the two vertex of the edge, using the iso surface value as the input parameter for the interpolation. The first image (taken from http://paulbourke.net/geometry/polygonise/) shows the vertices and edge numbering convention used for the marching cubes, and the second image shows how one voxel is crossed by the iso surface in the edges 11, 2 and 3, generating a set of three vertices in the edges commented, the triangle generated is allocated on those three vertices obtained. Since the calculation of each vertex position can be done individually the process can be easy parallelized using the GPU. Also the total amount of vertices to generate can be obtained in advance, this allows to allocate the required memory to generate the geometry, since the process relays heavily on tables that define the amounts of vertices per voxel. A common approach to implement the marching cubes algorithm in the GPU is to use geometry shaders since the method is expected to generate a set of vertices from a single voxel query, this represents a big limitation in webGL because the current pipeline only supports vertex and fragment shaders. To overcome this impediment histopyramids can provide an effective way to allocate the required vertices needed to create the triangles. The complete process for the surface generation can be separated in three different blocks, which are the potential generation, active voxels evaluation and finally the generation of the corresponding vertices positions with its normals for the triangles to render. This three blocks are defined in the following diagram. 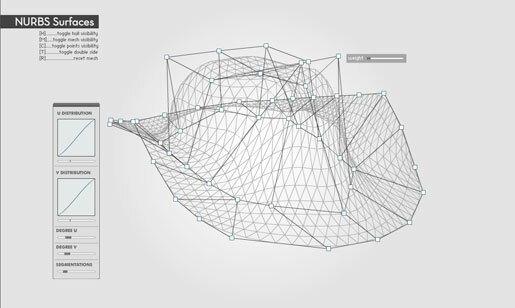 The marching cubes algorithm requires a potential field that has to be generated from the particle cloud. This is done using a separable blur that spreads the particle data generating the required potentials, the resulting blur creates a simulated non signed distance field blurring in the 3 main axes where the coefficients and the the radius of the blur control the smoothness of the surface. Since the blurring process is a quite demanding step it can become the bottleneck of the surface generation, it all depends on the size of the 3D texture used to allocate the voxels where the particles reside. In order to improve the performance of the blurring process a 3D compacted texture is generated, using the RGBA channels of the texture to compress the different depth buckets of a conventional 3D texture. The idea is to take advantage of the vector capabilities of the GPU to place all the voxel data in the four channels of each fragment, that would allow to blur the 3D texture on a smaller texture size. As an example a 256^3 texture can be simulated on a 4096×4096 non compressed 2D texture, where the space will be segmented in 256 buckets of 256×256 pixels. The previous texture can be compressed using a 2048×2048 2D texture where the “R” channel holds the 256×256 size buckets which depths are between [0-64), the “G” channel holds the buckets which depths are between [64-128), the “B” channel holds the buckets which depths are between [128-192) and the “A” channel holds the buckets between depths allocated in [192-256). The image above shows two examples of a 256^3 compacted 3D textures. A simple inspection shows 64 (8X8) buckets of 256×256 pixels, where the depths can be read counting the bucket position and the corresponding RGBA color displayed. Notice that the same 2D position can represent more than one bucket (left 3D texture), in this case the white pixels represent that there’s a voxel with data for all the four depths encoded in those fragments. //2D index to allocate the position of the particle in the corresponding texture. 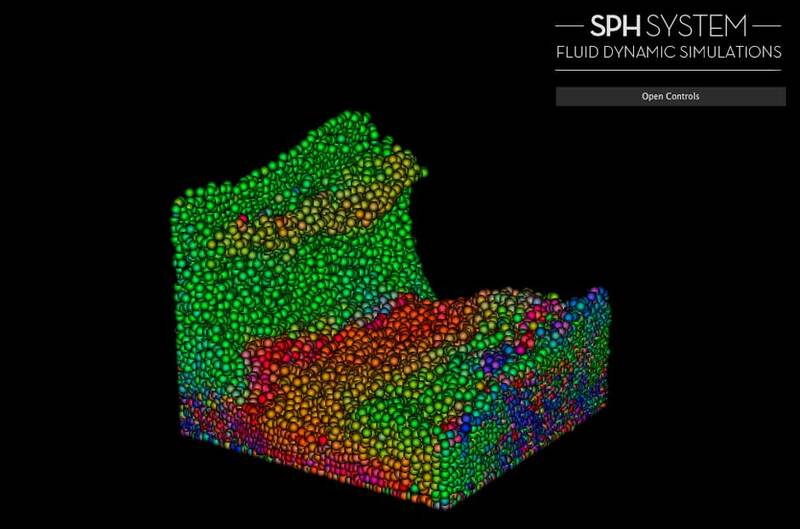 //Texture holding the positions of the particles from the simulation. //Size of the particle to draw in the 3d texture. //obtain the position from the particle in [0-1] space. 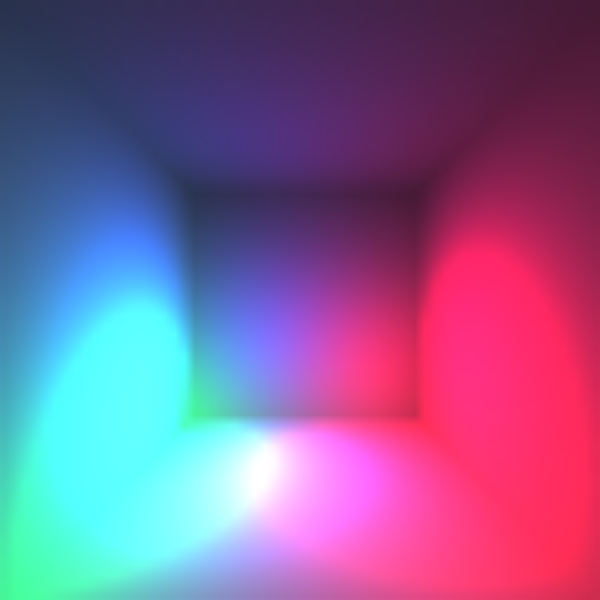 //Define the 3D position in voxel space [0-256]. //Obtain the corresponding 2D position for the 2D texture. //The color of the channel depends on the corresponding depth of the particle. //Set the size of the particle to render. The vertex shader uses the attribute aVertexIndex2D to define the UV required to read the 3d position of each particle represented as a vertex, these positions are saved in the uPositionTexture uniform. The uniform uSize is used to define the size of the particle in the voxel space, this is useful when there’re not too many particles in the simulation, or the geometry to generate is based on filaments generated from particles. c3D.x: inverse of the size of the texture 2D used to simulate the texture 3D (usually 1024 or 2048). 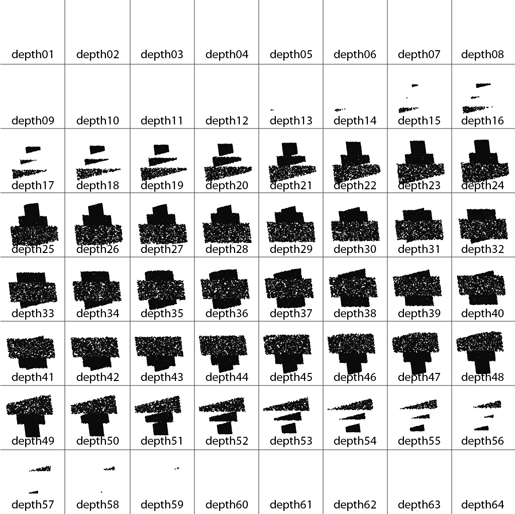 c3D.z: number of buckets allocated in the horizontal row from the 2D texture. Usually 8 or 16 buckets. Since the particles can have sizes bigger than one pixel, it’s required to represent them as cubes in the 3D texture. To do so the vertex shader uses the uOffset uniform, this value represents the displacement in the depth axis (in units) that the shader should offset to render the particle. This would represent the cube using the different slices to represent the size in 3D. This means that the program has to be invoked as many times as the size of the particles, incrementing the value of uOffset on each pass to render the corresponding slices of the particle’s cube in the 3D texture. One depth value is saved in the variable zLevel to define which channel will be used, since only 64 buckets can be represented per channel the zValue will define a value from [0-4). If the zValue is 0 the corresponding voxel will be encoding in the “R” channel, for a zValue of 1 the “G” channel is used, for zValue equal of 2 the “B” channel is used. Finally for a zValue of 3 the “A” channel holds the corresponding voxel. Once the 3D texture is filled with the particles a second program is required to generate the potentials using a 3D blur. This is done using a quad pass, and two different fragment shaders, one for the blur corresponding the non depth axis, and another fragment shader for the blur corresponding the depth axis. The fragment shader for the depth axis is defined below. //strength of the pixel to blur agains the other ones used. 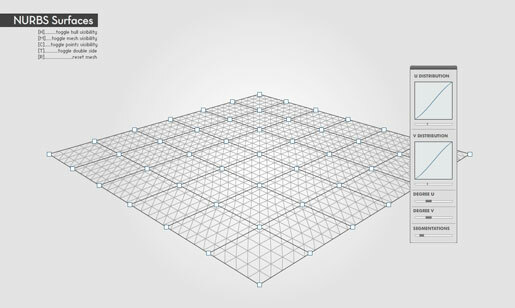 //Evaluates the 2d index value in the simulated 3D texture from the 3D pos. //Obtain the 3D pos of the corresponding fragment. //Obtain the z level for the corresponding fragment. //Obtain the new 3D pos of the fragment to use for blurring. //Obtain the z level for the new fragment to read. //If the new fragment is in the same depth range than the original fragment to blur then the same channels are used. //channel differences between the two fragments. //This avoids to spread information between the different buckets. Since the 3D texture is simulated using contiguous buckets in the 2D texture, the blur for the depth axis has to take into account the depth range for every fragment used in the blurring process, hence a vector is defined to know if the depth of the fragment to use is in the range of the depth from the fragment to blur. There are three different scenarios depending on the two depth values (fragment to blur “currentZLevel” and fragment to use for blurring “zLevel”), these are defined below. if zLevel is equal than the currentZlevel, the original channels are blended with the new channels with the following equation blend += newBucket.rgba. If zLevel is below the currentZlevel, the original channels are blurred with the new data using the following equation… blend += vec4(0, newBucket.rgb). if zLevel is over the currentZlevel, the original channels are blurred with the new data using the following equation… blend += vec4(newBucket.gba, 0). The three previous scenarios are used to match the compressed RGBA data between the two values, these equations are not necessary for the two other axis (non depth ones) since the blurring is done inside the same depth bucket. For the non depth axis a simple box blur is used defining the blurring direction based on a user provided uniform uAxis, this allows to make the 3D blur in three different separable passes. Notice that the filtering done is based on box coefficients, but these could be modified to make a gaussian filter or any type of filtering that could provide better results for the potential to simulate. The following image shows the result of the potential generation for the two previous 3D textures, notice that for the left image the buckets are separated avoiding blurring between the buckets. It can be seen in the left 3D texture that the appearance of the green and dark blue colors show how the different depths are being blended, meaning that the potential is being softened among the different depths. Once the potential is obtained, the marching cubes algorithm requires to evaluate the values in the corners of the voxels. In order to avoid software trilinear interpolations another quad pass is done over the result from the 3D blur passes to calculate values in the corners. Since it’s a quad evaluation the same vertex shader from the previous passes can be reused, and the corresponding fragment shader for the program is defined below. Notice that the corners evaluation is done using the compressed blurred texture from the previous pass, this means that the same blending equations have to be used to match the different channels based on the depths regions of the fragments to use. With this final pass the algorithm has two potentials textures, one for center values and other for corner values, this last one is the texture used for the marching cubes steps. For the marching cubes steps it’s not necessary to work with a compressed texture, hence a expansion step is used to obtain a 3D texture where each voxel is represented using a single fragment from the new texture. This is also done using a fragment shader defined below. //Define the depth range for the corresponding fragment. //Set the value of the fragment based on the depth and the corresponding channel. The previous shader expands a 3D compressed RGBA texture allocated in a 2048×2048 2D texture where the visual buckets are allocated in 8 x 8 array of 256×256 fragments buckets. The result is a 4096×4096 texture where the visual buckets are uncompressed into an array of 16 x 16 buckets of 256×256 fragments. The different constant values for the expansion are defined in c3D_h and c3D_l. The shader evaluates the 3D position of the fragment in the expanded texture and search for that value in the compressed texture, using the depth range to define with RGBA channel will be read to obtain the corresponding information. The image below shows the result of the expansion from the texture. The left side of the previous image shows the compressed data in a 2048^2 area, allowing to calculate the blur and corners evaluation much faster than using a non compressed data. A speed up to 4X is gained based on the fact that the compressed texture area is 4 times smaller than the non compressed one. 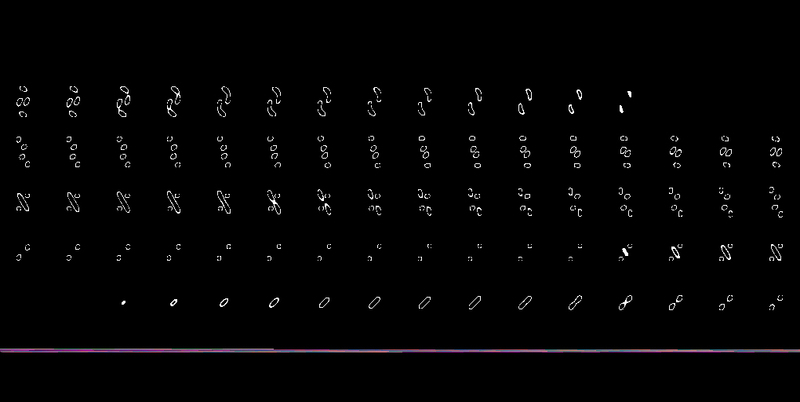 The right side shows the expanded result where the 256 depth buckets can be inspected visually without color interpretations. One of the big limitations when doing GPGPU computing is that since the architecture is designed to work on parallel, re arranging or compacting data is a non trivial task on the GPU, to overcome this limitation different stream compaction methods have been created, being histopyramids the algorithm that will be discussed in this post. Histopyramids are useful since it allows to allocate the data at the beginning of one texture, avoiding to evaluate complex shaders in fragments that don’t have useful information, that’s why this process is quite important making general computation using graphic cards. The following image shows what is achieved with stream compaction. The texture represent a set of slices from a simulated 3D texture showing the different Z levels, in a 2D representation the data is scattered all over the texture, The colored line represents the same data compacted and displaying the 3D position of the voxels reallocated. Implementing histopyramids is not a straightforward process, it requires two different steps which are reduction and traversal (compaction). 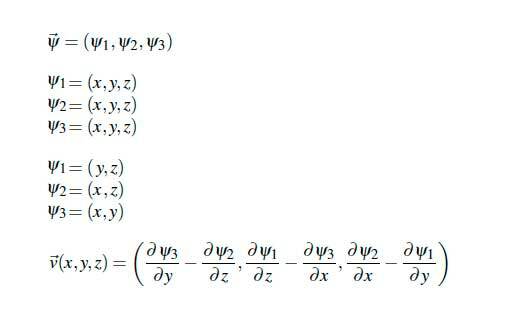 The first phase, reduction, is the process where the algorithm generates a set of textures levels based on the original texture (base texture) holding the scattered data; the amount of textures to generate in the reduction process are based on the size of the original texture using the following equation. For the reduction process, a base texture has to be generated from the original data texture, the idea is to define a binary image where each position will be marked with a RGBA value of vec4(1.) in the binary new texture. This would define a transparent texture where the white texels represent the data’s position allocated in the scattered original texture. This first step is quite similar as the mipmapping generation from the GPUs, but instead of using a median reduction for the generation of each texture, each pixel of the parent level of the pyramid is calculated using the sum of the four pixels contiguous of the leaf level texture. At the end of the reduction process a pyramid of images is created where each level represents the sum of the pixels from the leaf levels. The top level of the pyramid, a 1×1 texture represent the sum of all the data present in the base texture. Once the reduction process is completed and the pyramid is generated, the traversal is required to compact the data. The total data to be allocated in the compacted texture is defined in the top level of the histo-pyramid (the 1×1 texture). Each one of the output elements of the resulting stream has to traverse the pyramid to finally obtain a UV position (texture coordinates). 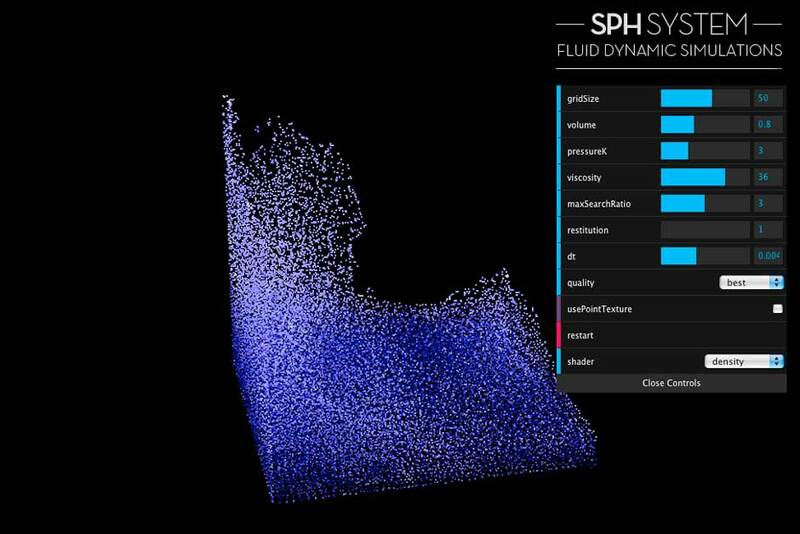 This texture position relates the output stream with a data value from the scattered texture. The traversal is done using a key index for each texel from the output texture, meaning that each pixel would be associated with an incremental unique 1D index that would be used to compare against the different levels of the pyramid. Also each texel from the pyramid would be re interpreted as a key interval value. Each traversal step evaluates where in the ranges the key index of the output stream can be allocated (or falls into), that range gives a 2D texture position for each level traversed. On each new level a new set of ranges have to be generated and a new UV position is extracted based on the range where the key falls into. It’s important to specify that the ranges are generated in a “Z” order from the four adjacent pixels. In the final phase, the base texture is used and the ranges would be of a unit difference, meaning that this step gives a UV coordinate that can be used to read the corresponding data in the scattered texture and place that data in the output telex from the stream. In this case the key falls into the [2, 1] position of the base texture, since this texture is a 4×4 texture the corresponding UV coordinate would be [0.5, 0.25]. This coordinate would be used to read the data from that position in the scattered texture and write the read value inside the position relative to the key used to traverse the pyramid. Since all the important operations will be done in shaders, there are two main programs that have to be created, a reduction program and a traversal program. All the programs will be performed over a quad, meaning that the vertex shader is only responsible to generate the vertex positions of the quad and to provide a UV coordinate for each fragment in the fragment shader. //attribute for each vertex, in this case a simple index key. //Define the position of the vertex. The vertex shader evaluates all the data for the vertex on execution time, but the user can also provide attributes with positions and UV coordinates for each vertex if desired. The fragment shader works similar to a mipmapping shader, hence four texels from the input texture have to be read and the resulting color would be the sum of those four values. This can be done with the following shader. //it must be a float point texture. // 1. / size of the previous level texture. //uv coordinate of each fragment obtained from vertex shader. The fragment shader reads the adjacent information from the evaluated fragment and sums that data to obtain the final fragment color. Since this shader is applied to all the different levels of the pyramid during the reduction process, it requires to know the actual size of the texture evaluated, this is provided in the uSize uniform being more conveniently defined as the inverse of the size value. //Original texture with the scattered data. //1x1 texture containing the total amount of data to compress. //UV coordinate for each fragment. //amount of data to compress. //compaction for a 4096x4096 texture. //pyramids with levels lower than 14. 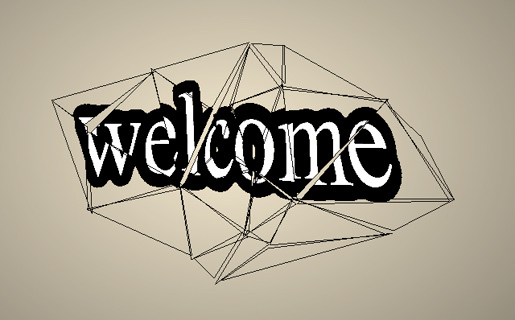 //The offset sets the texture reading to the position of the level to use in the pyramid texture. //boolean to float are used to define the new relative position (uv for the next level). //Sets the position for the next level traversal. //The same traversal operation is done with the base texture instead of the pyramid texture. //The color for this example is the 3D position relative to the 2D position of the UV obtained. * uTexture3D.x = size (length) of the base texture. * uTexture3D.y = size of the 3d texture simulated in the 2d texture (ex. a 128x128x128 3d texture can be allocated in a 2048×2048 texture, the corresponding data for this value would be 128). * uTexture3D.z = number of buckets of the 3D texture allocated on one side of the 2d texture. (based on the previous example the 2048 texture side can allocate up to 16 buckets of 128 x 128 layers). * uTexture3D.w = quantity of levels generated in the reduction process. Notice that this data is mostly used to evaluate the 3D position based on the UV position obtained in the final traversal (this traversal is adjusted for a marching cubes application), so on a generic case only two values would be required for this shader, the size of the base texture and the amount of levels generated in the reduction passes. – uBase: this would be the base texture generated from the scattered data. – uTotalData: this is the 1×1 level texture that defines the total data to compress. Having a single pyramid texture avoids the use of different uniforms for each level, which also limits the shader to a defined amount of maximum levels based on those uniforms. The image below shows an example of a Pyramid texture generated in the reduction process. Another advantage of this single image is that it allows to debug issues in the reduction process, since it’s straightforward to visualize any issues that could arise when reductions are generated. The traversal process is done using a for loop which is limited by a constant upper bound since webGL only allows to use constants to define the loop, this shaders is limited to up to 14 traversal loops, hence textures up to 4096×4096 can be used in this shader. To avoid the use of if branching the traversal evaluates the first three ranges using vector masking and logical comparisons, the final range comparison can be evaluated as the difference between the total range of the whole loop and the first three partial ranges evaluated before, that avoids to evaluate another texture read. Since the quantity of loops are the same one for each thread is the same, and there are no “if” branching inside each iteration, all the threads will execute the same amount of instruction ensuring that the shader won’t have any divergence. The use of a unique pyramid texture requires to use an offset position that has to be updated for each new loop, this offset has to be included inside the UV coordinate obtained to traverse the next level. Since the base texture is not included in the pyramid texture, the last traversal is done outside the loop, this final step uses the base texture to define the final UV positions required. The traversal is done in the fragment shader where each fragment has an unique 1D key defined by it’s position on the texture, the key generated is used for the traversal. If the user would like to write the parser in the vertex shader it’s important to define two attributes for the vertices, the first one would be the position of the vertex in the final texture and the second attribute would be the key for that vertex to use in the traversal process. One important thing of this algorithm is that it doesn’t require scattering (or repositioning) of the data (vertices), hence all the final positions of the data will be known in advance. In that regard using the fragment shader for the traversal has the advantage of avoiding positioning the vertices with the vertex shader. On a final note the user can observe that if the traversal shader is applied to the whole texture, there will be fragments that will generate keys outside of the total amount of data to compress To avoid this issue the level0 pyramid texture (1×1 texture) is provided as an uniform using its value (the total data to compress) to compare against the key generated by the fragment’s position. If the key is higher than the value from the texture the fragment can be discarded. This could also be done with the final level allocated in the pyramid texture since the 1×1 texture is also copied into the pyramid. Packing and unpacking of floating point values. The last two programs are required to read floating point values in webGL using the gl.readPixel() command. This command only accepts 8 bit RGBA values to be read, hence the sum represented in the 1×1 texture can only be read packing the data from a floating point value to a RGBA 8 bit value that represents the 32 bits of the original data. To do so the following fragment shader is run over a 1×1 quad. This two functions are pretty straightforward, they just generate a texture with a clamp to edge filtering, allowing the user to define if the texture would be a floating point texture or an unsigned_byte, also if there’s data provided it’s passed to the texture during the creation of it. The second function allows to generate a frame buffer based on a texture provided, it has a color attachment for the texture and a depth attachment for z buffering if required. tRead and fbRead makes reference to the texture and frambuffer used to make the packing of the floating point value present at the top level of the pyramid to be transferred to this texture using the RGBA 8bit encoding. “PACK_DATA” program: to compile this program the quad vertex shader is used and the packing shader is the corresponding fragment shader. It requires the same attribute than the previous program, and the uniforms are the 1×1 texture sampler input and a value representing the max value available to encode with the shader. “PARSE_PYRAMID”: this last program uses the same vertex shader than the previous two ones and the fragment shader is the one that defines the traversal. The uniforms used are defined in the previous explanation for this shader. To use the compaction function the three programs have to be generated, compiled and have their uniforms and attribute declarations ready. Pointers to the shaders uniforms are saved in the same array position that holds each program as a dynamic attribute, these pointers are used to send the data to the GPU on each invocation of the compaction function. The previous function required the initial texture to be compacted, the frame buffer where the result will be saved and an expected amount of the data to process if the user doesn’t want to use the gl.readPixels method to accelerate the process. 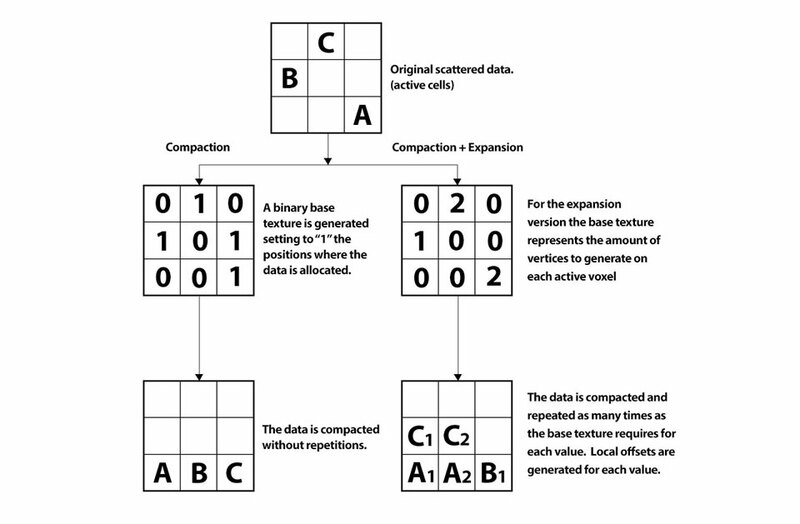 The function itself reflects the two steps of the algorithm (reduction and compaction) in two different program uses, in between the user can decide to read the amount of data in the original texture using the readCells boolean variable, defining a third optional step (in between the reduction and compaction steps). The first step, reduction, invokes a set of quad draw calls on the different pyramid textures using the reduction program, for each iteration a new size is calculated and the corresponding uniforms are send. After the new level is generated the end result is copied to the pyramid texture using the copySubTexImage method, using an offset to separate each level of the pyramid in the same texture. This first step doesn’t require to use a depth test, but since the function can be run on each frame is important to clear the color buffer for each level. Notice that the program used for this step is the “GENERATE_PYRAMID” program. To overcome this limitation an expected amount of data is defined as part of the arguments of the function to supply a way to avoid the use of the gl.readPixels method. The idea is that since the GPU can read the data in the traversal shader any fragment that doesn’t require to be traversed will be discarded, and for future steps the user can safely assume that the data processed is below the expectance defined by the user. The traversal process invokes the “PARSE_PYRAMID” program and it generates a quad draw using the scissor test to avoid any operations on fragments that are outside of the range of data to compact. To calculate the region of fragments for the scissor an area defined as the size of the texture and the ratio between the totalCells divided by the size of the texture is used, if the total cells are not read using the second step then the expected amount of cells is used. With the scissor test and the discard method the traversal function is accelerated. The function returns the total cells read in the second step, or the expected cells defined by the user (the value gets unmodified), it also saves the compacted data in the provided frame buffers ready to be used for subsequent GPGPU operations. The previous function used to helper functions to bind textures to the corresponding program and to bind attributes too, these functions are defined below. The previous shaders are a straightforward implementation from the algorithm explained before, but there is a quite nice improvement that can be done in the traversal shader to jump from three texture reads on each level to only one; this is done using vec4 histopyramids. The following image illustrates the modifications to the algorithm in order to implement this variant. These kind of pyramids make the reduction in a different manner, since the GPU allows to work with four channels per pixel the reduction shader can be rewritten in order to save the partial sums of the four pixels read instead of the total sum done before. 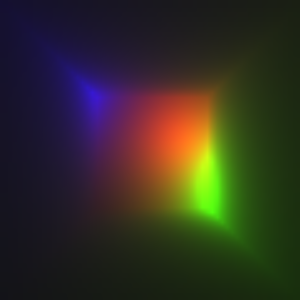 This can be seen in the following fragment shader. In the previous shader the program saves the partial sum on each channel of the final color, this allows to read the ranges using only the parent pixel, which means that the traversal only requires to allocate one texel from the texture level to traverse. Also the ranges can be evaluated faster since once the end of each range is defined creating the start values of the ranges is trivial. The following shader shows the implementation of the traversal with only one texture read. In the next post a marching cubes implementation for WebGL will be explained using this compaction method. 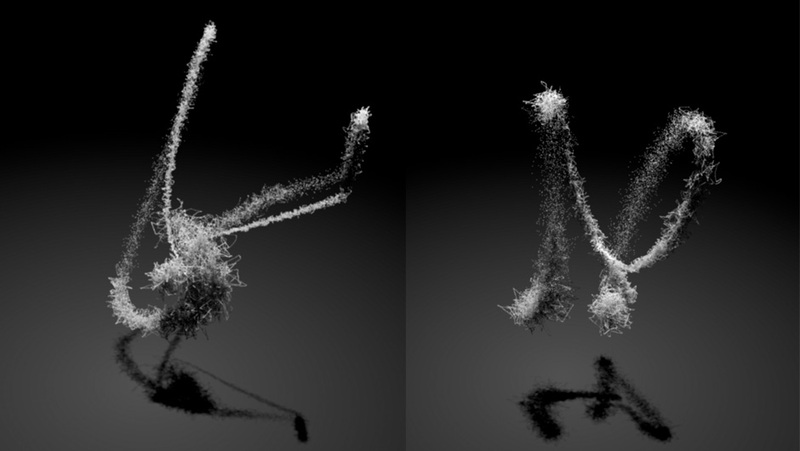 In the last post we talked about the implementation of volume shadows in a particle system, this last approach used a couple of for loops in order to define the final shadow intensity for each particle. This loops could make that the application has to evaluate 32 * nParticles the shadow map, making the process somehow very low. So we tried a pair of optimizations that would deal with the defects of the previous work, the first thing we have done is to change all the texture reading to the fragment shader, and then we tried to make the sum of the shadows for each step with the fragment shader also. At the end of the working process we defined the next steps to get the shadows done. 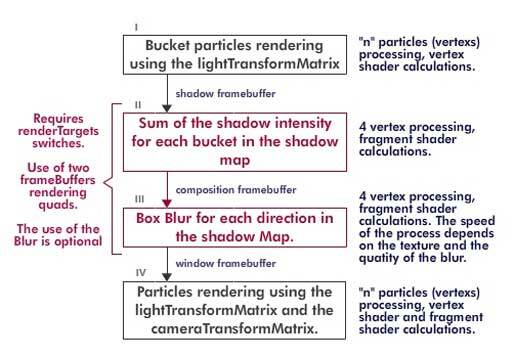 The first step is no different that the last approach, we defined 64 buckets in the vertex shader using the depth of the particles assuming that all of them are inside a bounding box, then we render them in a shadow framebuffer defining a color depending on the shadowDarkness variable. For this step we use the same getDepthSlice function in the vertex Shader. There is one very important difference in this function from the previous one, this new one requires two parameters, one offset and the transformMatrix. The second one is used to tell the function which view (camera view or light view) is used to define the buckets, this is usefull If you try to use the buckets system to sort the particles and blend the buckets. The first parameters offers you the possibility to obtain the next or previous bucket from a given depth, with this we can interpolate from two buckets or layers, that would give us a linear gradient of shadows between two layers instead of 64 fixed steps. This step is the main optimization from this code, what it does is to blend the previous bucket into the next so you can define all the shadows for each layer in 64 steps. Blending the buckets require to use the gl.BLEND and to define the gl.blendFunc using gl.ONE and gl.ONE. This step has no difficulty, but requires the use of a composition framebuffer for a intermediate destination, this is made to avoid the forward loops in one texture. We defined the blur in two differents passes, one for the X component and another for the Y component, we used a simple box blur but you can perform a gausian blur or some other blur you like. 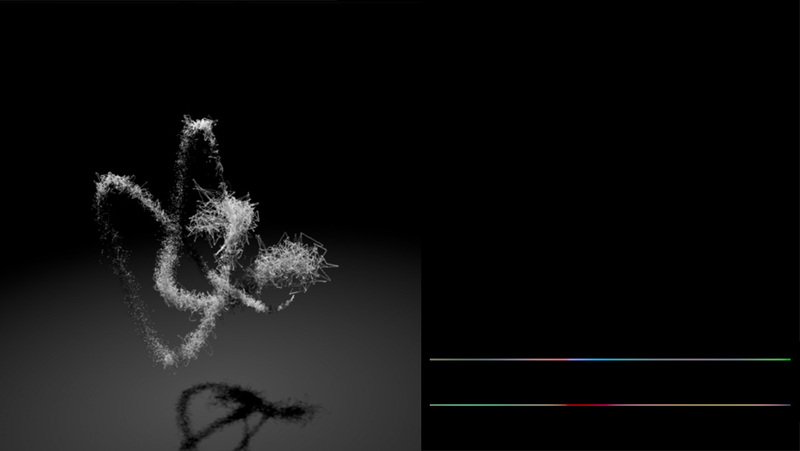 In this final step we render all the particles to the window framebuffer using the shadow texture, the lightTransformMatrix and the cameraTransformMatrix, first we transform then to the light view to read the correct shadow intensity from the map. In this part of the process you could read the shadow force for the particle depending on the depth and the bucket, but this would make that all the particles in the same bucket would show the same “force” even though their initial depth are different. This is when we use the offset parameter from the getDepthSlice function, for a given depth and bucket we can obtain the current bucket and the next one and interpolate the shadow force of the current depth between those two layer. Once the shadow force is defined we have to transform the particle position to the camera view to obtain the light attenuation and position of the particle, and finally render it. Here we get the uvTexture coordinates for the current bucket and the next one (notice that we call the getDepthSlice function using an offset of 0.0 and 1,0), there is also the attenuation calculation in for each particle in this shader. Here we can define a color tint for the shadow, we also read here the shadow from the texture in the current bucket and the next one to perform the interpolation fot the final shadow intensity. And that is it, four steps to render the shadows, this steps gives you the chance to blur the shadows, make some interpolations between two shadow layers and the possibility to tint the shadows. But it has some disadvantages too, this process requires multiple changes of render targets, and it requires a good variables definition to make it work. 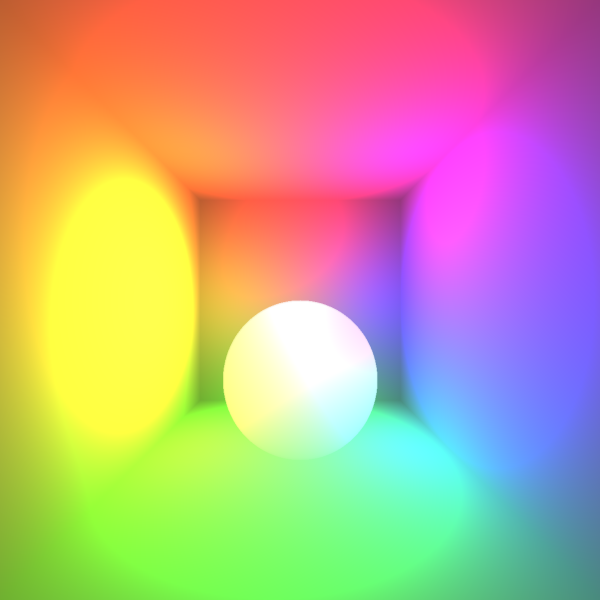 – shadowBlur: it defines the blur in the shadow map. – shadowDarkness: as it name says, it makes the shadow darkness or lighter inside the volume and the shadow applied in the floor. 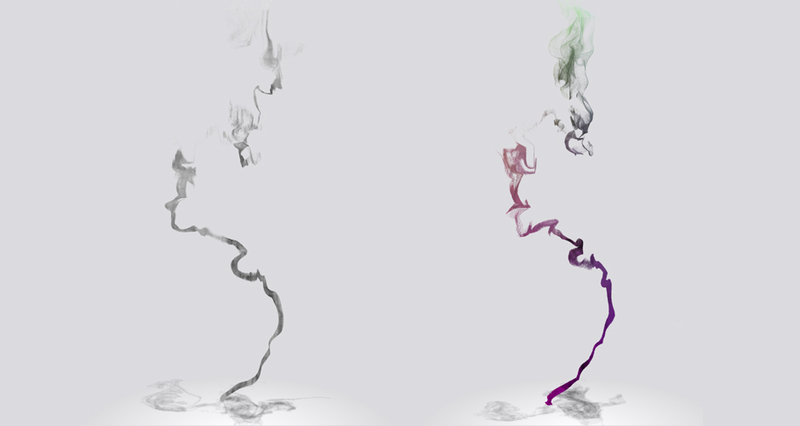 – shadowTint: it “tints” the shadow with the particles color. – lightAngle: it allows you to change the light direction from 0 to 45 degrees, this helps you to see how the shadows change in the volume and on the floor depending on the position of the directional light (remember that it´s always pointing to the center of the object). – cameraRatio: this ratio gets you closer or farther to the volume. – useAttenuation: it toggles the light attenuation over the distante (squared), if on you will see the effects of the shadows plus the attenuation, if off you will see only the shadows in the volume. – useInterpolation: it toggles the interpolation between two buckets for a givven depth of a particle in those two layers. With a high bRatio and this variable off you should see the segmentations of the shadow in the volume. – showTexture: it shows you the final shadow map used for the volume shadows and the floor shadow. To read it right you should start from botton to the top. The closest points to the light are in the left down corner of the image, and the final shadow (the one used in the floor) is in the top right corner of the imagen. – bRatio: this is the most important variable of the whole process, this float defines the bounding sphere ratio that contains the volume. You must define one sphere that holds all the particles inside or you will find some glitches in your rendering. But beware, you could be tempted to define a big bounding sphere for the current volume, but what you are really doing is assigning less layers for the volume. For this example is really ease to define the bRatio, but when you are animating the lights and the particles things starts to get messy and the only thing left is to define a big bounding sphere. If this is the case you could end up with 16 to 8 layers for one volume, and that is when the interpolation of the buckets information helps. Try to play around with this variable and turn on and off the interpolation and you will see the effects of it. As we said before we hope we could write a third article using this method to do some animations. Working with surfaces in Flash can be done in many ways, Away3D offers one way to work with Bezier patches that is suitable for many things (one example of this is this very nice example of the Utah teapot), but if you want a more precise interpolation among the control points, the Nurbs surfaces give you more control over them. 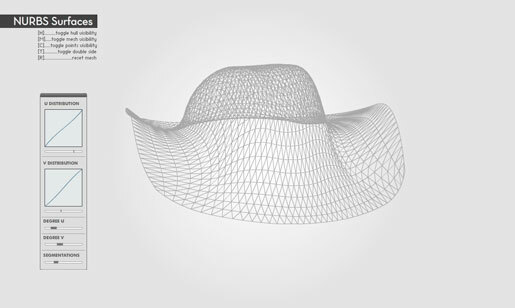 Nurbs surfaces require to understand how the Nurbs curves work, We have written one post about it, so if you haven´t read it yet press here. The surfaces are a extension of the curves, the only thing is that you´ll need to parameters (u, v) in order to define the surface, so when you are going to calculate the surface you need to calculate the curves in one direction “V” and the results are used to calculate the curves in the next direction “U”. The main advantage of Nurbs surfaces against Bezier surfaces is the control of the degree for each direction, this means that for each surface you have two independent degree values (degreeU, degreeV), that define the local control interpolation for each direction. 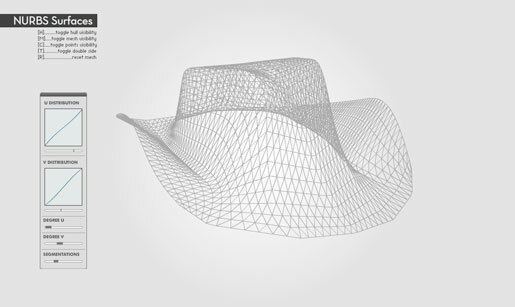 Nurbs surfaces also count with the posibility to adapt the weight for each control point in order to make the surface go closer to that point. The modeller presented in this post allows you to work with one Nurbs surface of 7X7 control points, you can change the degree for each direction, the segmentation for the whole surface and the distribution of the domain region parameters. Nurbs surfaces can be seen as a two dimensional non linear transformation of a rectangular domain region [0-1] [0-1] to a parameter region. This behaviour presents one problem when you try to tessellate the surface because if the parameters in the domain space are equally distributed, the result of the tessellation in the parameter space is not going to present the same equal distribution. In order to overcome this issue a couple of cubic transformations are used to define the distribution of the parameters, these curves are located in the surface editor of the modeller (the light blue boxes). If you rotate the surface (try to make it when is plannar) and change the sliders of the boxes you will see how the distribution of the segments change, this should be done in the plannar case for each change of the degree in order to get an equal distribution in the parameter space. These curves don´t solve the distribution problem in a exact way. The best thing to do is to calculate the parameter that should be used for each step forcing the condition of a fixed step between each point in the curve. This process requires to precalculate the curve, then calculate the curve´s length to define the step for each pair of points, and finally use the first derivates of the curves to calculate the needed parameter. The bad thing about the previous process is that it requires many iterations for a given parameter in order to evaluate if the parameter fits the defined fixed step, so this is not a good solution for real time rendering. The change of the degree in each direction change the interpolation factor (local control) for each direction, the same control points (with the same weight definitions) can result in NxM differents surfaces (being N the number of control points in the U direction and M the number of control points in the V direction). So you can have a linear interpolation in one direction and cubic interpolation in the other (second image), or you can have a quadratic interpolation in one direction and a cubic interpolation in the other (third image). One advantage of working with parametric surfaces (Bezier or Nurbs) is the total control of the level of detail for a given surface. The tessellation of the surface can be done evaluating the error of the aproximation from the parametric surface, this means that defining the error (distance from a given parametric point to the tessellated point in the surface) you could know exactly the segmentation needed o satisfy the error. In the modeller you have an option for segmentations changes in the surfaces if you want to have a better or worst aproximation. Changes on the segmentation can be used in real time to satisfy a required frame rate and level of detail, if you have many surfaces on one scene, you could define more segments for the surfaces close to the camera and reduce segments for the surfaces away from the focal view. This would help to speed up the rendering of one scene. The last option in the Nurbs editor control the total segments used to tessellate the surface, you can model with low segmentations (keeping a high frame rate to move the points and rotate the shape), and then you can see the final result giving more segmentations to the surface. If you want to try the modeller just press on the next image. As it is explained before, implementing Nurbs surfaces require the use of Nurbs curves, so part of the actual code is explained here so only a new function is needed to calculate the surface tessellation, just copy the code from below in the Nurbs class (from part 1). //Points fot the “U” curve…. There will be a third part of these series of post (Nurbs in Flash) based on how can the surfaces be rendered using the advantage of the parametrization for the vertex normal calculation and other features that speed up the rendering in real time (only for parametric surfaces).